You know, there are a lot of “hidden gems” on the Super Nintendo. Many are no longer “obscure” because they’ve received their just due and praise over the course of the past decade or so. But there remains a few titles that I still see don’t get the kind of recognition that they so richly deserve. 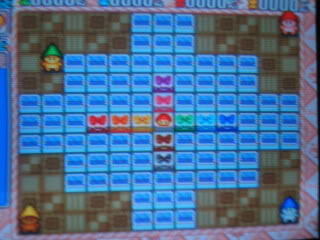 Puzzle’n Desu! is one such game. It’s truly one of the best games on the system that you might have yet to play, or even heard of before. 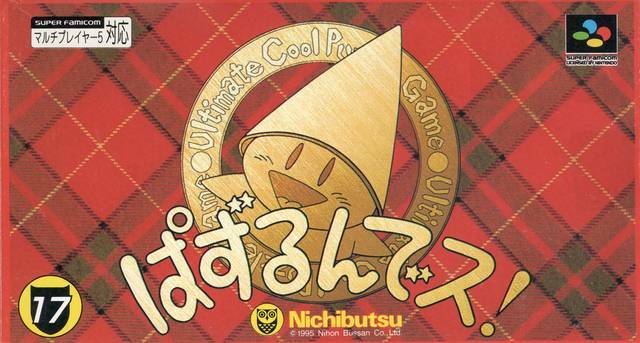 There’s a reason why the box says “Ultimate Cool Puzzle Game.” Hey, them some bold words. 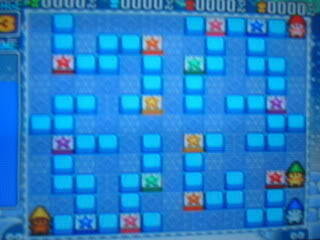 But if any puzzle game can live up to such a high title, it’s this one. Hell of a brain teaser, this one. 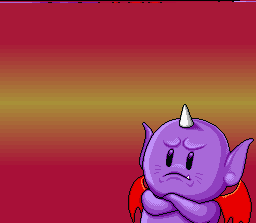 You move the little guy on the left around a giant square arena, trying to match all the like colors. You can only push one block at a time, and it’ll travel until it’s stopped by a wall or block. 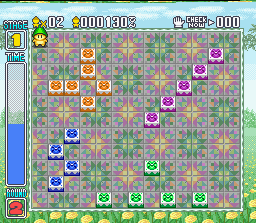 Three like colors, minimum, are required to make a successful match. Sometimes there are four instead of three, so you must connect all four. Match only three in this instance and you’ll fail (as there would be one block remaining). Let’s take a look at the first few stages. 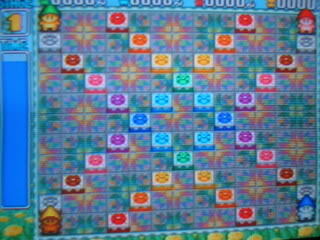 I like the way the blocks disappear. The little visual effect is always a welcomed sight. Hey, it’s the small stuff, right? There you go, now this pink formation is ripe for the pickings. Can you solve the rest? 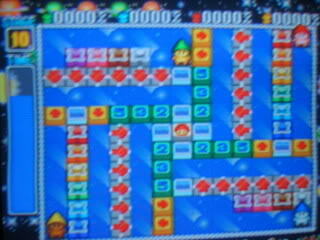 As you can imagine, the later puzzles become murderous. 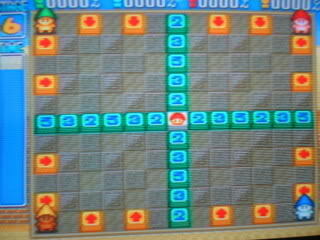 Interestingly enough, this mode can be played with up to three friends. 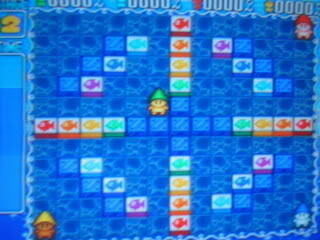 I believe this is the only Super Nintendo action puzzle game that allows you to do such a thing. Very cool stuff! 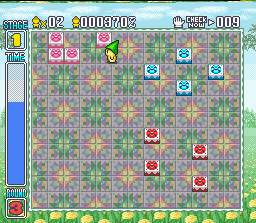 An ace 4-player battle mode is included! 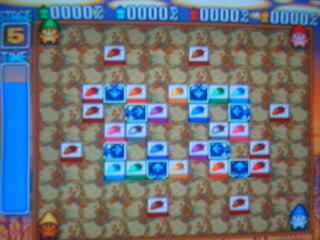 Much more than a mere afterthought, this can rival Bomberman believe it or not! The goal is simple. Squish your opponent(s) via block pushing. The winner is the sole survivor. 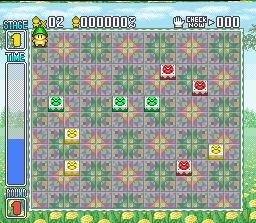 And for good measure, you get 10 different stage designs, whose block placement is randomly generated, enabling countless variants! 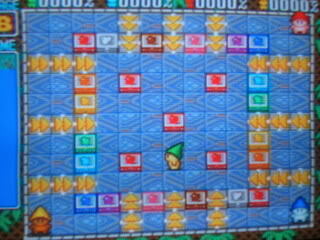 (similar to the map system of the beloved WORMS franchise). 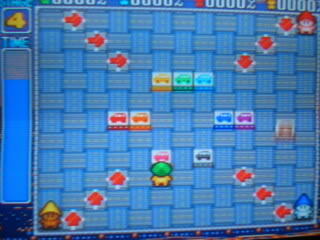 Note the “A” command is only valid in the battle mode, for obvious reasons. Also, even in this mode blocks will disappear when accidentally or purposely matched. Awesome continuity. It’s your typical no-frills, no gimmicks first basic stage. Blue blocks with the % marks are immovable. The ice blocks dissipate when pushed against a wall or block. I like this stage. The arrows determine the path of destruction. It’s very Super Bomberman-esque. Those arrows affect block AND player movement — nice! The arrow blocks here can only be pushed in the direction they’re pointing. The numbered blocks travel their respective number (i.e. 3 spaces). Very interesting, and rather different! Great gimmick here. Arrows guide block movement. Easy to kill yourself if you don’t watch it. When walking on arrows, they act like butter, sliding you in their set direction. The blocks here can be pushed despite touching each other. They fly across and through the screen disappearing whether they’ve crushed someone or not. Arguably the most chaotic stage due to its potential of numerous blocks zooming by at break-neck speed in all directions! A veritable smorgasbord of the other battle arenas. Good stuff. Unfortunately, this mode is restricted to human players. Why they didn’t allow computer opponents is a mystery. But it’s better than nothing. 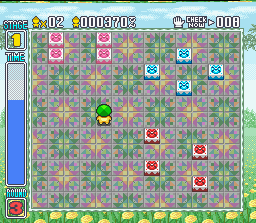 Like Bomberman, 2 to 4 can play, with the win total required for a stage adjustable from 1 through 10. To cap things off, a create-your-own-stage option is available. I love this game. 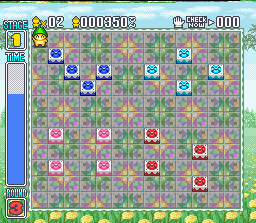 The ability for a 4 player mode in the regular game and a Bomberman-esque 4 player “free for all” mode really makes this game stand out from the crowd. These games possess a purity I can’t help but love. They’re simply brilliant and brilliantly simple (yet complex). If you love pitting your logic skills to the test, and especially if you have gaming buds, hunt this gem down. From what I understand though, it’s rather scarce. It’s not perfect, though. I am not a big fan of the timer. I feel like these action puzzle games benefit greatly when you’re able to take your sweet time and start contemplatively at the screen until inspiration strikes with the resolute “AH-HA!” Also didn’t like the fact that the 4-player battle mode is exclusive to humans only. 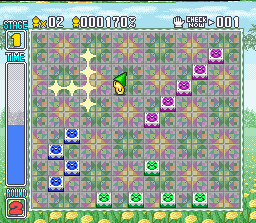 I mean, it would be lovely to be able to play this mode on a lazy Tuesday night when it’s just you and your Super Nintendo. But at the end of the day, at least the mode is there as an option. All in all, Puzzle’n Desu! truly rocks. And deserves a little more recognition in the retro gaming community. Highly recommended! Thank you for writing this! 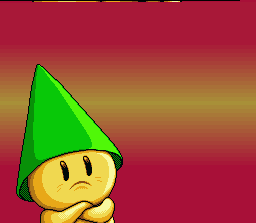 Probably over ten years ago my best friends and I played a game out of a bunch of emulators we had randomly collected and stumbled upon a game we affectionately referred to as “Gnome Squish”. After the weekend was over we forgot the real name of the game and it or no where felt inspired to try to find it again it the list of hundreds of games. I started googling Gnome and ice blocks and had no luck until I found your list and prayed that someone else had an affection for this game and I’d be able to recognize it based on your descriptions, and huzzah that was the case! Thank you again for loving this game as much as us and for writing this so we could find it again. Hey Chi, good stuff! 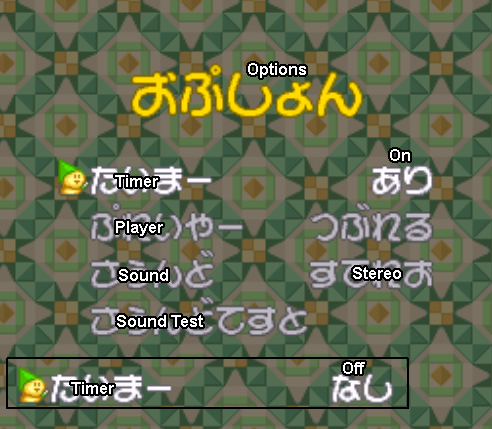 I didn’t know that you could turn off the timer… that’s very cool. Gives me a good excuse to revisit this hidden gem once again. I just wish there was an option to select as many computer opponents as you wanted in the 4 player battle mode. If I’m not mistaken, only human players can play and you need at least two to play the mode. Too bad you couldn’t set it to 3 computer opponents or even 2 if you’re playing it with the significant other. 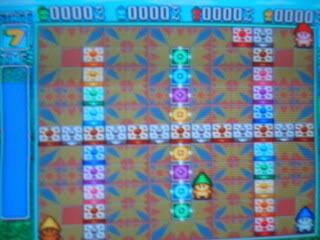 But yes, Puzzle’n Desu! is definitely and easily one of my favorite obscure gems on the SNES. If they remade it for the Nintendo Switch, I bet it would kill it with a brand new audience and generation of gamers. Another reader recently and affectionately deemed it “Gnome Squish” which is just too damn stinkin’ cute, LOL!